* Material is easy to scar if hot. Wood shakes offer a natural look with a lot of character. Because of variations in color, width, thickness, or cut of the wood, no two shake roofs will ever be the same. * Wood offers some energy benefits, too: it helps to insulate the attic, and it allows the house to breathe, circulating air through the small openings under the felt rows on which wooden shingles are laid. * Mold, rot, and insects can be a problem. * The lifecycle cost of a shake roof may be high, and old shakes can’t be recycled. * Most wood shakes are unrated by fire safety codes. * Many use wipe or spray-on fire retardants which offer less protection and are only effective for a few years. There are pressure-treated shakes, however, that are impregnated with fire retardant and meet national fire safety standards. * Made by companies like Chemco, this pressure treating extends the life of wood shingles and provides better fire safety performance. * Installing wood shakes is more complicated than roofing with composite shingles, and the quality of finished roof depends on the experience of the contractor as well as the caliber of the shakes you use. * The best shakes come from the heartwood of large old cedar trees. Care should be taken when selecting shakes as the quality varies greatly from different shake mills. 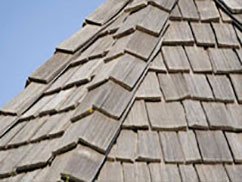 Clay roofing tile is a good choice for homes with a southwestern, Italian, or Spanish Mission design, or even for homes with a modern, clean look. 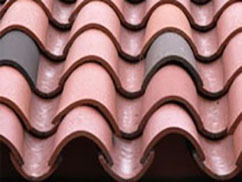 • Tile lasts a long time – its expected lifespan is greater than the lifespan of the material on which the roofing rests. • Tile won’t rot or burn, and it can’t be harmed by insects. • It requires little maintenance and comes in a variety of colors, types, styles, and brands. • The biggest drawback to clay tile can be its weight. Depending on the material used to make it, tile can be very heavy – so heavy that extra roof support can be required. • With some new materials, however, color is added only on the surface of the tile, and they can fade over time. Although most modern tile is kiln-fired into the tile making the color permanent. • Tiles are fragile, so walking on them can break them. That makes it more difficult to accomplish maintenance like painting or cleaning rain gutters or fireplaces. 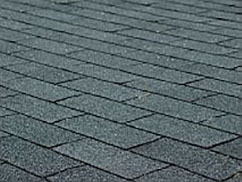 • Initial installation can be more complicated than other roofing materials. • Finally, tile can cost more than other roofing materials. 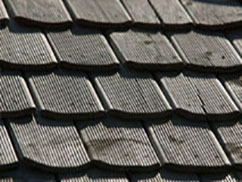 Slate – actual shingle-like slivers of rock – is another roofing material that shows up in more upscale homes. • Slate is an expensive choice, but it offers a very natural look and can be laid out in a variety of patterns. • invulnerable to rot and insects. • It comes with a good selection of sizes and colors, although colors are limited to those found in nature. • Slate can be very heavy, sometimes requiring expensive extra support. • Slate is breakable enough that walking on it is difficult for a non-professional, complicating such tasks as rooftop maintenance, gutter cleaning, and painting. Concrete tile is now a roofing material. Shingles, simulated wood shakes, lighter-weight tiles and concrete panels are being manufactured from a variety of fiber-reinforced cement products. Some are coated with plastics, enamels, or thin metals, and some contain recycled material. Although the products themselves are not yet recyclable, they are a good choice for durability and resource efficiency. • Are resistant to rot and insects. Many tiles mimic the appearance of wood shakes while improving on the durability and fire protection that real wood affords. It can approximate the look of clay tile or slate while mitigating the structural problems caused by the weight of the real material. Concrete is more expensive than some roofing materials, and early types of concrete roofing had problems with the material curling, breaking and changing color. Technology has improved, however, and these problems have mostly been overcome. Style and color choices are expanding, and by mixing the cement with additives, manufacturers and making lighter and lighter products. • Metal roofs can also be made to resemble wood shakes, clay tiles, shingles, and Victorian metal tiles. 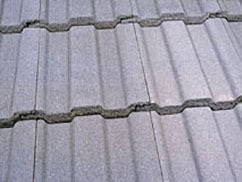 • Aluminum or coated steel is formed into individual shingles or tiles, or into modular panels four feet long that mimic a row of shingles or tiles. • Metal roofs are durable, fire retardant and almost maintenance-free. 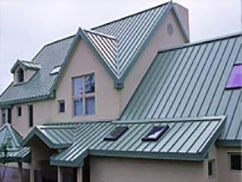 • They are also energy efficient; metal reflects heat and blocks its transfer into the attic. • Research by the Florida Solar Energy Center in 1985 showed that metal absorbed 34 percent less heat than asphalt shingles, and homeowners switching to metal roofing reported saving up to 20 percent on their energy bills. • Steel roofs offer other environmental benefits as well. They are made from between 60 percent to 65 percent recyclable material. Because they weigh very little, metal roofing can be installed over existing roofs, eliminating the need to dispose of excess material in a landfill. Installing some metal roofing can be an intricate process best done by a professional, and the initial cost of a premium metal roof is higher than most other roofing materials. You need to compute the life cycle cost to see if paying more to begin with for a metal roof will prove to be a better investment than some other form of roofing.